If you have ever wanted to try FPV inside your own home now you can with this ready to go package from E-Flite! The ever popular Vapor now has an option for a FPV camera backpack that’s ready to give you a first person view! Poised at the optimal point on the aircraft, a tiny video camera sends full-color, real-time action back to you on the ground. The view is so immersive that you’ll feel as though you’re actually sitting in the pilot’s seat of the model airplane. 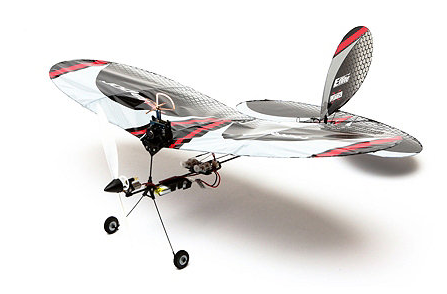 Plus, the FPV Vapor ultra micro aircraft is small enough to enjoy in many large indoor spaces, such as a gymnasium or even outdoors in your own backyard. The ultra-lightweight design, combined with its efficient motor system, allows the airplane to have outstanding handling even when it’s flown at slow speed. Which means you can experience First-Person View Flight virtually anytime and anyplace.